I’m a long time Duck fan whose first game, at age 11, resulted in Bobby Moore (Ahmad Rashad) setting the Oregon single game rushing record against Utah. a record which stood for almost 30 years. Seemingly against all odds the Oregon Ducks find themselves in the NCAA Sweet Sixteen. I’m sure they blew up more then a few tourny brackets. With convincing wins against both Oklahoma State and Saint Louis how does it look for the Oregon Duck’s chances to move on to the Elite Eight? In a word, not good. On the other hand it is a winnable game. Following is a look at what you might expect to see and what Oregon has to do to stay in the game. First the scoop on Louisville. Many consider them the best team in the tournament. They win by pressuring the ball and forcing their opponent to turn the ball over a lot. They also get a lot of offensive rebounds when they miss shots. This is like getting a free possession. Besides good ball pressure they play relentless defense. Oregon, when they play their best, pressure the ball and gets turnovers. They get a lot of offensive rebounds. When they do miss shots they get offensive rebounds. They also play relentless defense. In other words, both teams take the same approach. The difference it that Louisville generally does it better than Oregon. But it is only one game and anything can happen. For Oregon to stay in the game they are going to have to minimize the number of times they turn the ball over and they are going to have to minimize the number of Louisville offensive rebounds and second chances. The problem with all that is that you minimize turnovers by going with a smaller, quicker lineup. You limit your opponents rebounding game by going with a big lineup. Therein lies the dilemma for everyone who plays Louisville. How do you minimize one without hurting yourself with the other. Go small and you get beat on the boards. Go big and you risk a flood of turnovers. So while it is a big order, Oregon has a secret weapon that just might give them on opportunity to beat the odds and get away with a win. His name is Arsaian Kazemi who hails from Esfahan, Iran. Yes that Iran. The first NCAA Division 1 basketball player from Iran has special talents. For one he is a very smart basketball player. In addition he never quits hustling and he has great basketball instincts. He is a small forward who is a rebounding machine. In the first two rounds he collected 17 and 15 rebounds respectively. His teammates complain that hey takes their rebounds. He says he doesn’t look to see who is around. He sees the ball he grabs a rebound. If the Ducks are to have a chance he is going to have to have another big rebounding game. He is the one player the Ducks must have on the floor. Normally in this situation you worry about foul trouble. But good news Duck fans. Kazemi, like I said, is a smart player. He has yet to have more than 3 fouls in any game this season. By moving Kazemi to center the Ducks will hope to play a smaller lineup but still be able to hold their own on the boards, minimizing Louisville’s offensive rebounds. This will allow Oregon to play their three talented guards at the same time. The teams that have defeated Louisville this year have generally done it using a three guard lineup in order to break Louisville’s press. Louisville doesn’t have a lot of quality big guys. So if Oregon can attack the one very good big guy they have (Dieng) it could pay off should he get in foul trouble. That would give Oregon the option to play one of their big men more often and could provide an advantage later in the game. Oregon destroyed Oklahoma State with a zone defense but don’t expect that in this game. Oregon will be totally focused on limiting Louisville to one shot and playing a zone defense hurts your rebounding game. This doesn’t mean they won’t use it from time to time. Dana Altman loves to mix up defenses even if it is just for one possession This keeps the other team off balance and slows them down as they first have to recognize the defense and then adjust their attack. Keep Louisville to 10 or fewer offensive rebounds. If they can do that and shoot a decent, not outstanding, percentage it could come down to the wire. While Oregon has nothing to lose, Louisville has everything to lose since they are considered the favorite to win it all. If Oregon hangs around the pressure and tension will steadily mount on Louisville. I predict that Oregon either wins by a few or else they lose by 10 to 15. I just don’t see a lot of ground in between the those two scenarios. Your prediction? Leave a comment below. Word is out that Chip Kelly and the Philadelphia Eagles will attempt to sign former Duck Dennis Dixon who currently is on the Baltimore Ravens practice squad. For my friends who are into the NFL Fantasy League scene — and you know who you are — here is a tip for you. If Dixon winds up in Philadelphia next year grab him early in your draft — he will be a bargain. If winning football games is your biggest priority then make it 6 things. A winning record of 46-7 is no small accomplishment. But looking long-term there are 5 other things that, when the disappointment clears, I think will be recognized and appreciated. Putting aside for the moment the NCAA investigation, which is likely more smoke then fire, Chip built his program the right way. Every player he signed to a scholarship as a head coach made it into the university. I’m sure that very few programs can match that. Chip brought in kids that wanted be Oregon Ducks and had the character traits that would make them good members of community. Players spend time doing positive works in the community. Giving back was not just taught, but practiced. I’m in Arizona with my friend Gary awaiting tonight’s Fiesta Bowl between the Oregon Ducks and the Kansas State Wildcats. We are staying with my wife’s parents John and Mildred. After waking up with Duck Gnome hovering over me begging to go to the game I had a nice breakfast and the four of us sat around and talked about everything but football. 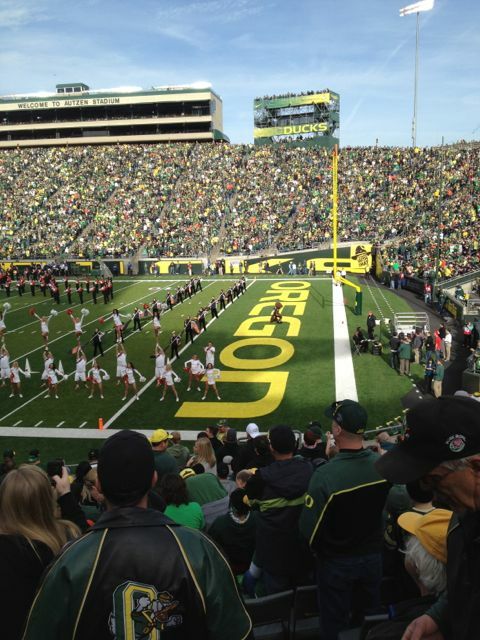 The 3rd ranked Oregon Ducks start Pac 12 Conference play against the 21st ranked Arizona Wildcats this Saturday. That means it’s time to check on my preseason predictions. PREDICTION: The Oregon Duck’s redshirt freshman quarterback, Marcus Mariota, will be a sensation. Why? I expect him to be one of the most accurate passers that will have ever played at Oregon.